This entry was posted in Thomas Jefferson, writing on October 4, 2018 by John. This entry was posted in writing on March 4, 2018 by John. I’ve recently joined a local writers group, and a few weeks ago the group’s leader asked for any advice or rules of thumb we might have to offer other writers. Here are a few. When writing fiction, think in terms of scenes. Each scene must include at least one of the following: a decision action that propels the plot, a character making a decision to take such an action, or a discovery that changes a character’s relationship with other characters and affects future actions. A scene is about at least one of these things happening. A scene typically builds to one of these things, and if a scene seems rambling or listless, focusing its actions and language toward one of these things will often bring it back on track. A story begins as a shopping list and finishes as sheet music. In the beginning, there’s something you want: either something you want to get down or some scene or action you want to start with. Eventually, though, when a draft of the story is covering all the action the story should contain, you need to turn to the sound of the words (which ideally you have been attending to all along). Sound and rhythm should support and enhance other effects in the story. Don’t neglect them. This entry was posted in writing on March 1, 2018 by John. What is your definition of a short story? I think it is the art of the glimpse. If the novel is like an intricate Renaissance painting, the short story is an impressionist painting. It should be an explosion of truth. Its strength lies in what it leaves out just as much as what it puts in, if not more. It is concerned with the total exclusion of meaninglessness. Life, on the other hand, is meaningless most of the time. The novel imitates life, where the short story is bony, and cannot wander. It is essential art. This entry was posted in authors, creative writing, writing on February 21, 2017 by John. This is the second in a series of posts about teaching writing to middle school and high school students. You’ll find the first post here. At a recent poetry reading at The Word Barn in Exeter, NH, poet David Rivard mused about the difficulty about identifying a theme for a book of contemporary American poetry. Speaking of his own work, Rivard said he was interested in the spontaneity or the performance of spontaneity (though he may not have used either of those terms) of each moment in a poem, rather than in an overarching story, theme, or framework uniting all the poems in a collection. But publishers, he noted, do want to know what a book is about. How will it hang together when finished and presented to the public? Their curiosity is driven by an understandable interest in marketing. How can they sum up the book to help sell it to readers? How can the collection be pithily described in the two lines of copy allotted to it in a publisher’s spring or fall catalog? Rivard and poet Jayne Benjulian, who also read that night, agreed that there might be a theme to a contemporary book of poems, but it might become evident to the poet only over the course of writing many poems over many years. Eventually, Rivard realized that he could organize his latest book around the idea of a standoff—the contrast between the everyday physical world and the ideas constantly running through his mind. But most contemporary American poets—Rivard cited Louise Glück as an exception—are wary of formally enunciated themes for books. And even though he eventually identified a theme for his book, Rivard is more interested in the experience of reading each poem on its own. Rivard and Benjulian’s discussion reminded me of reasons to be wary of themes in general when writing about novels, short story collections, or books of poetry. Themes may be present, but they rarely deserve much emphasis or sustained attention. Young writers of essays would be well advised to adopt Rivard and Benjulian’s wariness when selecting topics for essays. Why? Because noting the theme is one of the least interesting things that one can say about a book. 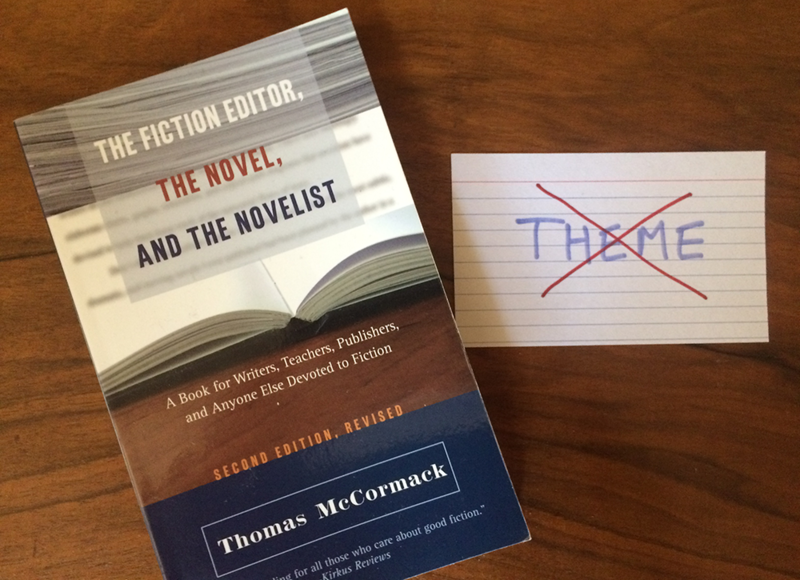 Especially in works of fiction, one may be able to identify a theme, but to say anything substantial one must immediately move on to noticing the details of how the theme is developed. Those details are almost always the interesting thing about a book, the thing that makes the book enjoyable and perhaps even powerful and memorable. The way ‘theme’ is taught is actively harmful. Depending on the writing instructor and textbook, a student might be assigned to write about a theme in the form of a statement that accounts for all the major details of the story. But the student is cautioned that the statement should avoid the form of a familiar saying, because by assuming that form—condensing the story to a maxim that might be stitched on a sampler—the statement might diminish the richness of the story. I now submit that, given the themes express above, to teach young people that these are the reasons for the stories being; that they were the purpose, meaning, and significance of Shakespeare, Chekhov, Welty et al. ; and that they are what students must struggle to get out of theme; this is a lesson of such mind-imploding fatuity as to amount to assault with a deadly weapon. The motivation of these authors, to get the student to pay close attention, to focus, is a good one. Their technique, a search for “theme,” is a bad one. Because it makes the student attend to the wrong thing, it focuses him in the wrong way. Instead of trying to extract a vague, platitudinous theme, students should be taught to appreciate the details of the work and to appreciate how these details, together, create the work’s “master-effect” (an idea that McCormack develops in the earlier sections of his book). What I recommend, then, is approaching the work of fiction with a program of questions devised to focus the reader on the effects achieved, and how the author achieved them. Examining the details of the work, page by page, provides a much richer ground for exploration. Such an examination cannot but highlight the individuality of the work. Is a book interesting because it shows us that “war is horrible?” Or is it interesting because it shows us, in vivid and original ways, people’s choices, actions, and experiences in war, and presents a rich tapestry of language that touches our hearts and broadens our understanding? In their critical writing, students should explore the details and the individual features of a work. This embodiment of meaning (as Flannery O’Connor put it) is much richer material than any tired moral that can be derived from countless works. This entry was posted in academia, Essay Camp, writing on November 21, 2016 by John. The next time you’re in a bookstore, ask the cashier where they keep their collections of five-paragraph essays. You’ll likely get quizzical looks. You might be asked if you’re looking for books on how to write a five-paragraph essay. You’ll answer, no, you’re looking for books filled with five-paragraph essays—you know, the kind children are taught to write in school. Of course, there aren’t any. The form is too constricted to serve the type of investigations that merit being published as a book. A five-paragraph essay is a useful structure for teaching basics like topic sentences, supporting evidence, linking sentences, and rudimentary arguments. But linger on them too long and they’ll seem confining. Almost nothing we read that makes any kind of sustained argument is so rudimentary in its form. Sure, some 800-word opinion pieces in newspapers clank out an introduction, three main points, and a conclusion, but any essay that appears in a magazine is bound to be more varied and complex. A magazine essay might involve two or three different stories lines. It might mix memoir with social commentary or political opinion. It might do any number of things—and that freedom is part of what makes essays so engaging and powerful as instruments of exploration. Now, there are probably students in every middle school and high school struggling to master the basics of the five-paragraph essay, so the idea of writing something more open-ended might seem like an invitation for chaos, logorrhea, or worse. But other students might be ready to try their hands at longer, more free-formed compositions. And even if students are not ready to try writing something longer and more complex, it’s probably not too early to read such pieces, so they start to get a sense of the choices available to essay writers. Then they can begin considering, too, the choices they are making, consciously or not, in their own writing. Our eight-grader is home this summer, and I’m asking her to read some real essays—articles from publications like Oxford American and The New Yorker. I’m also calling her attention to certain features in each of these essays and asking her thoughts about what the writer has done. It’s a kind of casual writing camp. I thought I’d post this on my blog, in case anyone else finds this sort of exercise useful. I’m planning on selecting essays from magazines we have lying around our house, but when possible I’ll choose essays that are also freely available online. The first essay is “Our Faith in Horses” by Jamie Allen from the Spring 2015 issue of Oxford American. This essay is about horses, horse racing, the often overlooked cruelty of the horse-racing industry, and our problematic relationship with horses. But it isn’t just third-party reporting on the horse racing industry. The essay also includes personal recollections, as well, including the story of the author’s sister’s relationship with her rambunctious horse Chief, and the author’s troubled relationship with his abusive father. How does adding this personal content enrich the essay? What contrast does the author draw between our relationship with horses and our relationship with one another? Find specific sentences that support your view. The essay begins in medias res–in the middle of things, the action already under way. Chief and his rider come charging toward the barn. In the course of the story, we learn the full story of Chief. We discover the occasion of his purchase, the difficulty of taming him, and the make-or-break session in which the author’s family decides whether or not to keep him. Go back through the essay. Flag all the parts of the author’s family’s story. Note the order in which they’re told. Do you think this order is effective? Why? One of the choices facing any writer of fiction or non-fiction who is reporting dialog is whether to quote words directly or to paraphrase them in summary. Quoting words directly—called direct dialog—has the advantage of being precise, but it can lead to longeurs if the dialog is not continuously engaging. Paraphrasing—called indirect dialog—has the advantage of brevity, but without an interleaving of direct quotations can sometimes make conversations seem remote and impersonal. (In the paragraph below, the first sentence is indirect dialog and the second two are direct. Read the passage below and pay attention to how Allen mixes direct and indirect dialog. Which things does he choose to paraphrase? Which does he quote directly? How do his choices heighten the drama of this passage? In the winter of 2013, I visited Miami’s Gulfstream Park, one of the country’s premier tracks. It was a shiny South Florida Saturday and as I crossed the parking lot I could hear the announcer over the loudspeaker, the crowd. The horses were running. I hurried in, made my way along the rail toward the finish line. The pack was rounding the far turn in the fourth race of the day; the crowd stood and cheered lazily, and a winner pulled away. I snapped a photo with my phone as the lead horse, wearing 7, passed. The sky was radiant blue except for a few cotton puffs hanging over the palmy track. What a day. Read the passage above again. It presents two contrasting moods: a sunny, peaceful day at the track, and the horror of a horse being killed on the track. The mood changes abruptly with the direct dialog at the beginning of the second paragraph. At first, like the author, we’re not sure what’s wrong. We, too, have to follow the old man’s squinty gaze to find the object of his apprehension at the end of the third sentence: “a horse down on the track.” The sentences and their structure force us to search for the center of the action; then, like the spectators in the stand, we find our attention is blocked and diverted. The horror is made hidden and routine. “They” (nobody described closely) “got him down again.” Workers unroll a gray blind, as they have countless time before. In your own writing, how might you use a mix of indirect and direct dialog to report such a scene? Try writing an essay that includes a personal story along with your analysis about an important trend, issue, or event. Break your personal story into distinct episodes. Decide how to order them, and how to interleave them with the rest of your analysis. Can you find a way to give your story more context–more sweep, as it were–while also giving analysis a personal touch? What are the strengths of this two-track approach? What, if any, are the weaknesses? This entry was posted in creative writing, Essay Camp, writing on August 5, 2015 by John.